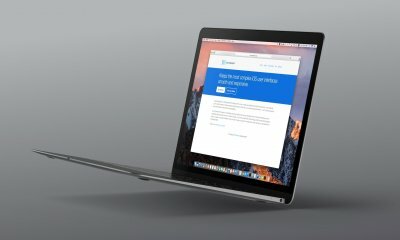 You may have heard that Facebook’s Parse.com, the popular Backend-as-a-Service (BaaS) is shutting down and all features will be permanently shuttered on January 28, 2017. Parse hosts approximately 600,000 apps, so this may come as a suprise to some. Unfortunately, many apps have relied solely on Parse for much (if not all) of their backend infastructure. While not a prerequisite, you are encouraged to read my Alamofire tutorial which explained in depth some of the technologies we will be interacting with in this tutorial. Note: Before you make this migration on a production app, I encourage you to perform it on a cloned or test app so you can gain insight into the process first hand before performing it on your app. The database is migrated to a service like MongoLab or ObjectRocket. The server be migrated to a cloud hosting company like AWS, Google App Engine, or Heroku. 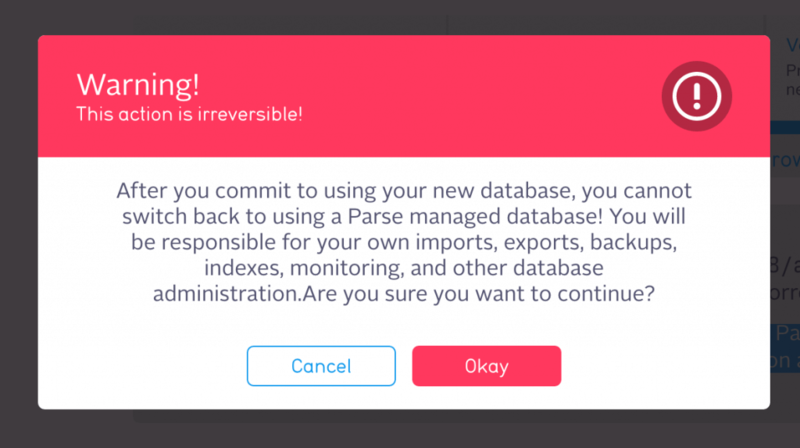 Parse has also put suggested deadlines in place: they suggest that by April 28, 2016 the database be migrated and by July 28, 2016, the server be migrated properly. This will give you ample time to work out any bugs and ensure your app functions properly with no downtime! A lot of people have asked me recently about why there are two steps to this migration. A Backend-as-a-Service like parse.com coupled two aspects of what’s known as a backend into one: the server and database. The server, which manipulates the database, performs queries, fetches information, and other work-intensive tasks, interacts with the database. The two work hand-in-hand to form a backend. With Parse going away, we must deal with the server and database seperately. Fortunately, one of the most beloved features of parse — the dashboard — is a work in progress. Additionally, most of the features parse users have come to know and love are built into the parse-server, making the migration as seamless as possible (that being said, there are several changes we will address in this and a follow-up article). Parse has also provided detailed instructions on how the entire migration will take place (as seen below). Today, we’re solely going to focus on the first phase: the database migration to get you ready for the suggested April deadline. We’ll tackle the server migration in a follow-up article in the coming weeks. If you read my Alamofire article back in November, we discussed using a database service called MongoLab. 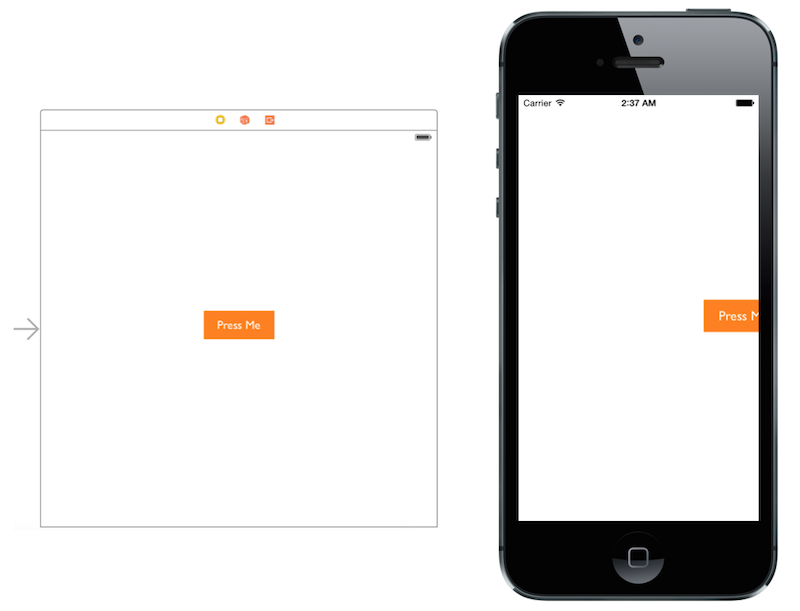 In this tutorial, we’ll use MongoLab because of its ease-of-use. 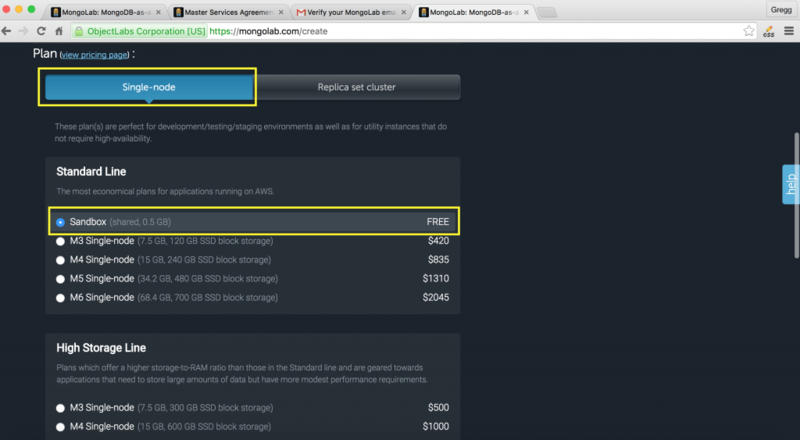 Keep in mind that you can host your own MongoDB instance on AWS, Google App Engine, Joyent, or Heroku. 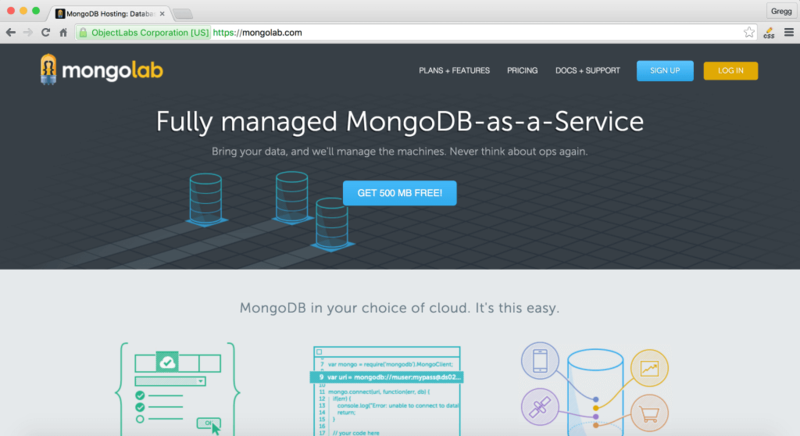 MongoDB is a popular no-SQL database parse was written upon. 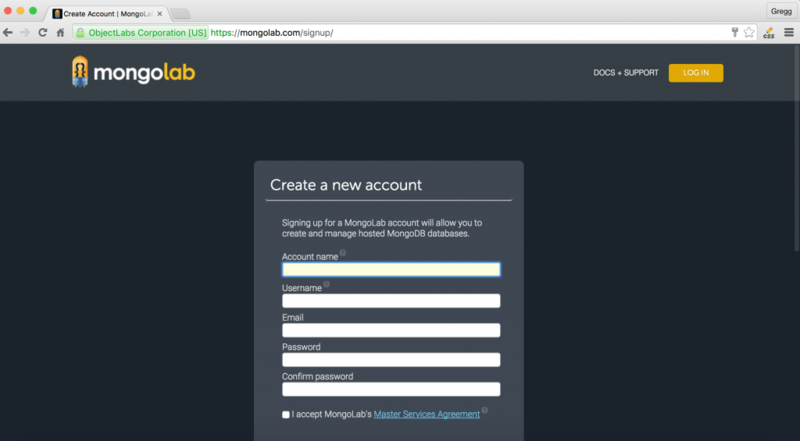 To begin, sign up for a MongoLab account on MongoLab.com. Click Sign Up and make an account. You will be expected to verify the account via email. Once you’ve verified your email, click the create new button. Now select Single-Node and go with the Sandbox (free tier). Keep in mind that depending on the number of assets and file size of your database, the sandbox may be insufficent for you. For the sake of this tutorial, I am using the sandbox as I am migrating a demo app, but you are strongly encouraged to research what storage plan will fit your needs best. 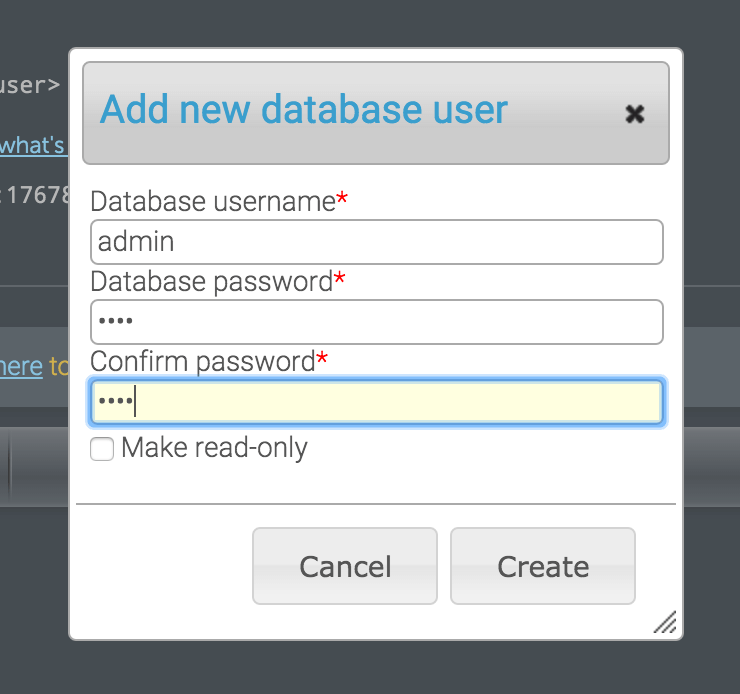 Scroll down to the bottom, add a database name. I am calling mine appcoda-test, but feel free to name it whatever you want. 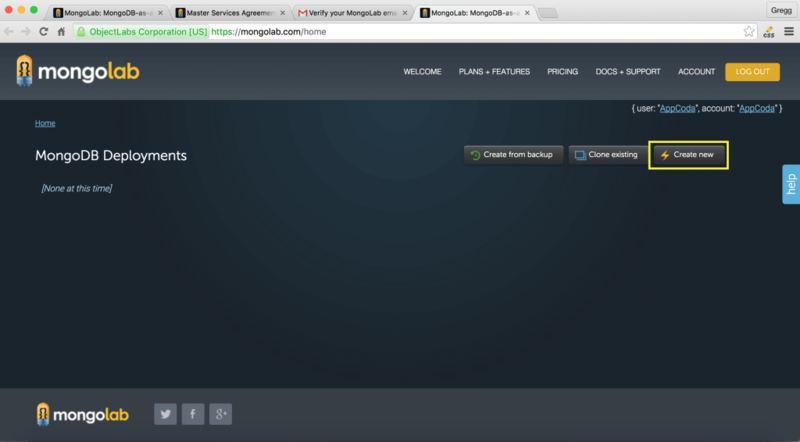 Then click the Create new MongoDB deployment button! Now select your database from the MongoDB dashboard. Next create a user so we can wire up the database. I named my user admin and set a password. Click create. If everything works properly, you should see a new user configured! Great job! Great job! We’re now ready to move over to Parse! Click on this link to view the new Parse dashboard if you have not already. Then select the app you want to migrate and next click “App Settings”. Scroll down a bit until you see a red button that says “migrate”. Click it. Keep in mind that you cannot undo the migration. So be 100% sure you are ready to migrate the database when you perform this step. From here on out, any database related concerns are no longer parse-related issues. You will have to manage and maintain your own database. Niether AppCoda, myself, not anyone else hereis responsible for any data loss, or issues with respect to the migration. That aside, the process should be, for the most part, a seamless one. Replace the database url with the path to the Mongolab database we established above. Click begin the migration again to proceed. 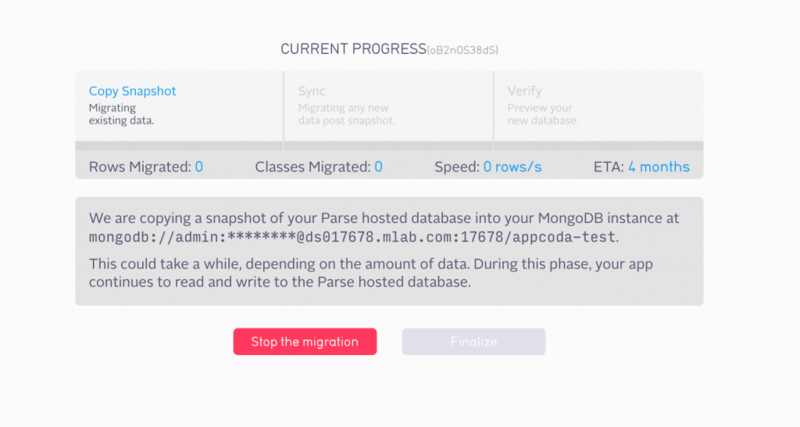 Parse should begin the migration process. Be sure to read the notice before proceeding. By pressing finalize you agree to complete the database migration. Data will no longer be managed on the Parse database but rather on MongoLab. After confirming that you are ready to migrate the database, click finalize. Awesome! The database is now hosted on MongoLab! 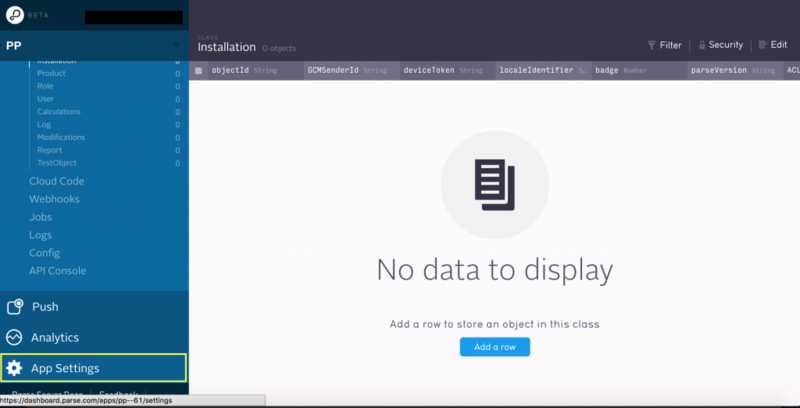 Return to your MongoLab dashboard to ensure the migration was successful. Return to Parse. Using the dashboard, add a new class to ensure the connection was successful. I named my class testClass, but feel free to name it whatever you want. Open the MongoLab website once more, and under the SCHEMA row, scroll down. You should now see your new class added. Congratulations! Parse is now reading and writing to your Mongo instance on MongoLab! That was pretty painless! Stay tuned for a follow-up article on migrating the parse-server to AWS, Google App Engine, Heroku, etc! what if the storage is greater than 500 mb? 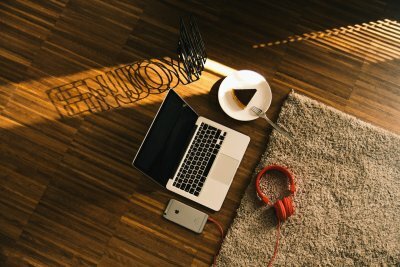 can i still use mongodb for that (free)? Great tutorial. Only problem – when I added the ?ssl=true parameter I consistently got a ‘No reachable servers’ error. In the end I just went ahead with ‘merge anyway’ without this parameter, and it worked. Any news about the “No reachable server” issue? Great tutorial Gregg! When do you think you might have the next article up on migrating the parse server? Coming very soon! Stay tuned! what about PFFile image file. how migrate them with another host? That is another topic within and of itself. The parse team is working on a solution for AWS S3. I will probably cover that when parse provides us their solution. Hi Alexander – I am working on a parse-server tutorial now but one that covers the parse dashboard is coming up soon. Can’t give you an exact date, but within the next few weeks! Stay tuned! Hi, I’m a developer and used to Parse.com. When I knew it would shut down, I began to look for alternatives and found http://www.back4app.com. I’m happy with my choice, there are several tools that serves me, and best of all, I managed to migrate my project in just 5 minutes!